During our travel this summer 2017 we'll be working with AIDS, Pregnancy, Malaria, Dyssentary and Mal-Nutrition among widows, children and the aging, while understanding the needs of their culture and limited resources. Education is a key component and we will be guided by local Nurses and Medical staff as we live and work within the Katosi fishing village community, along the shoreline of Lake Victoria. Our goal this summer is to assist in training community medical educators, home care providers and build and staff a sustainable Health Care Clinic. Trip cost 3500.00 per person - Includes Air, Lodging, Security, Food and Transportation. Trip length: 3-4 weeks depending on how long you want to stay - arrangements and accommodations are available if you'd like to stay longer. As always, thank you for your generous donations to the Ssejinja Children's Foundation! We the children of Uganda, especially in the schools of Bira and Musaka, wish to write to you and inform you that lack of education remains the key to many of Africa's problems. We are in need of basic materials. 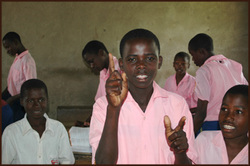 We are orphaned because we've lost our parents to AIDS and civil war. We can only help ourselves part of the way. We need your assistance for the rest of our journey of hope. We have found love, friendship and refuge in the dedication and commitment of the Ssejinja Children's Foundation. It has made our dreams come true by offering us a light of knowledge through education. 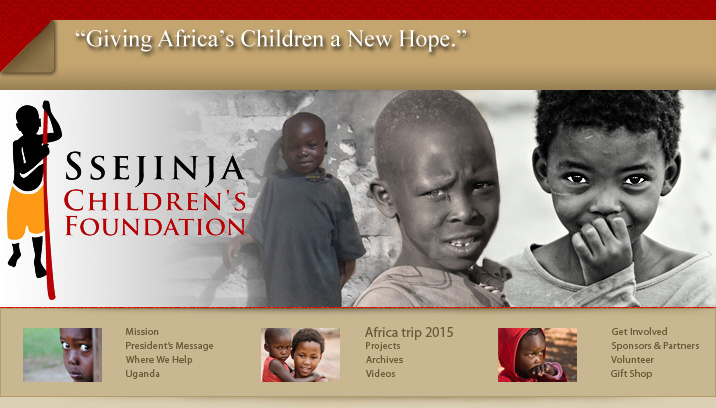 Please help the Ssejinja Children's Foundation so they can continue to support us.